With eleven lines, frequent modern trains and plenty of stations Barcelona’s metro is an excellent way to move around the city. You seldom have to change lines more than once to get anywhere in Barcelona. There is however one black spot; the dreaded tunnel at Passeig de Gracia! 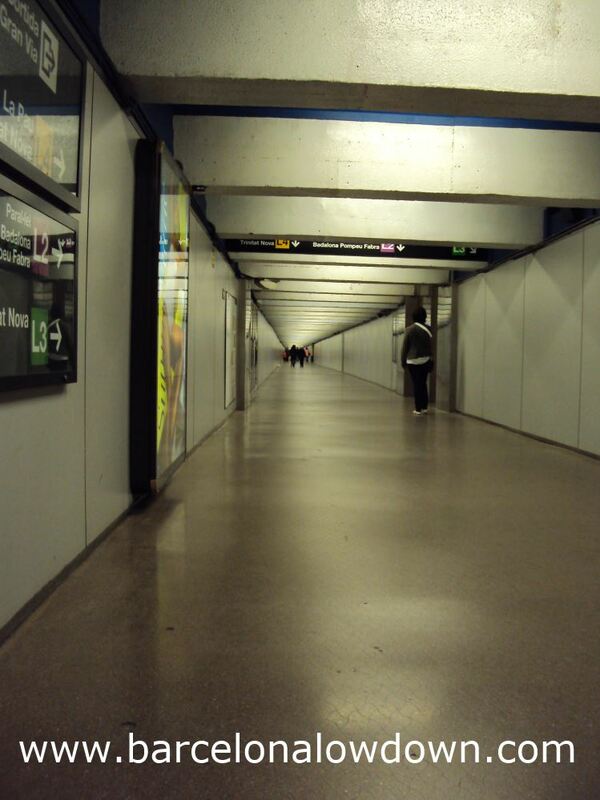 The dreaded tunnel at Passeig de Gracia metro station. Passeig de Gracia metro station connects 3 lines: Lines 2, 3 and 4. What you don’t see when you look at the metro plan is that the Green Line (L3) is connected to the Yellow and Purple Lines (L2 & L4) by a seemingly endless tunnel. It takes about 5 minutes to walk from line 3 to the other lines. I always try to avoid changing trains here whenever possible.